Wandering down the back alleyways of the Medina requires all senses be on high alert. 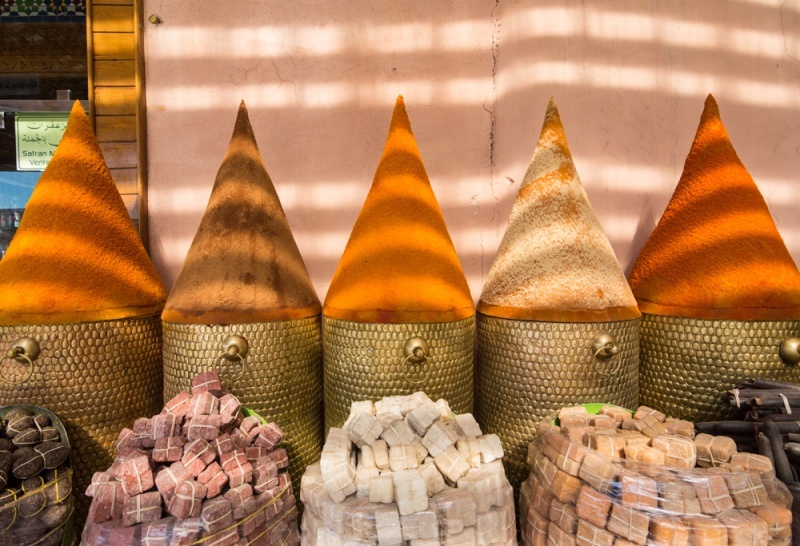 The fragrant and brightly colored spices stacked into perfect cone shapes, the gorgeous leather purses in every shape and size, and the large intricate metal lamps, all begging to go home with you. The patterned latticework surrounding colorful doors will have you reaching for your camera and forgetting to watch your step on the uneven dirt paths. And the motorbikes weaving through the crowds at high speeds will keep your adrenaline pumping. There’s never a dull moment in this bustling city! Read on to learn more about what to expect, where to visit, and what to bring when visiting magical Marrakech! Marrakech (also spelled Marrakesh) is thought to be either rooted in the Berber phase murr akush meaning “the land of God” or the Arabic words murra kish, which translates to “pass by quickly”, used to warn travelers of thieves and wild animals. After spending a few days in Marrakech, you’ll probably agree that both are accurate. 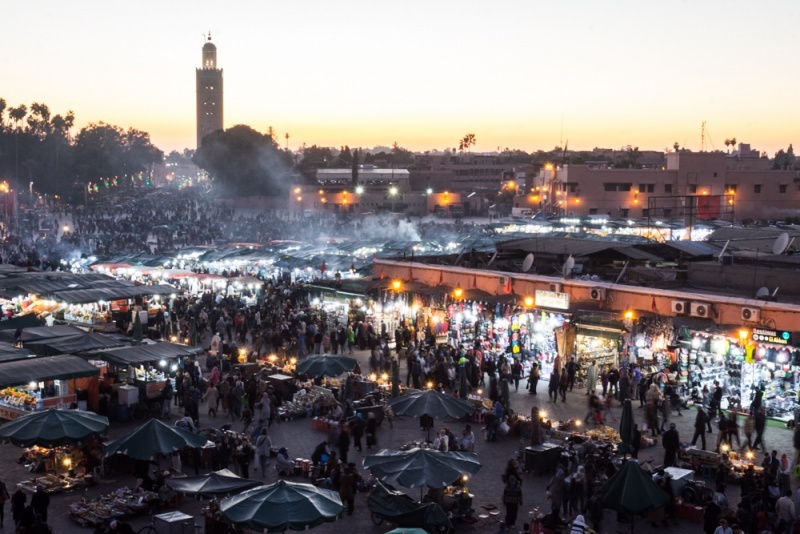 With a population of about one million people, Marrakech is still only the 4th largest city in the Kingdom of Morocco. 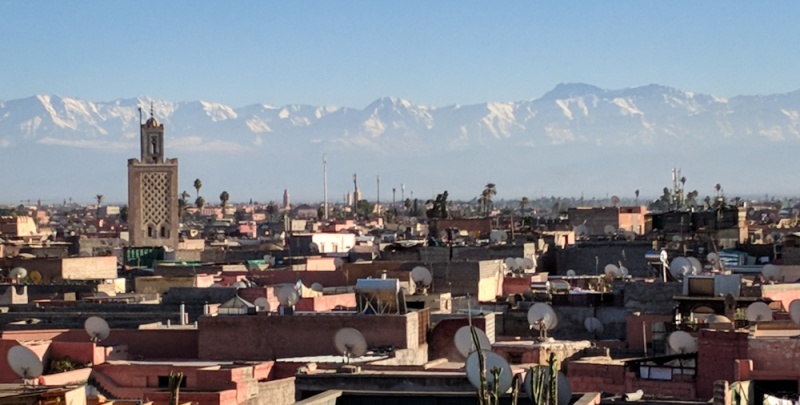 Situated at the base of the snow capped Atlas Mountains, on a clear day the view from the many rooftop restaurants and patios is absolutely unbelievable. Tourism has been steadily increasing in Marrakech and 2017 was a record year. For the first time in history the city welcomed over 2 million tourists in a year with more than 6 million overnight stays. On the international level, Marrakech ranked 6th in the most visited cities by the French during 2017. Tourists are flocking to Marrakech for the beautiful architecture, the vibrant colors, the inexpensive shopping, and the delectable cuisine! 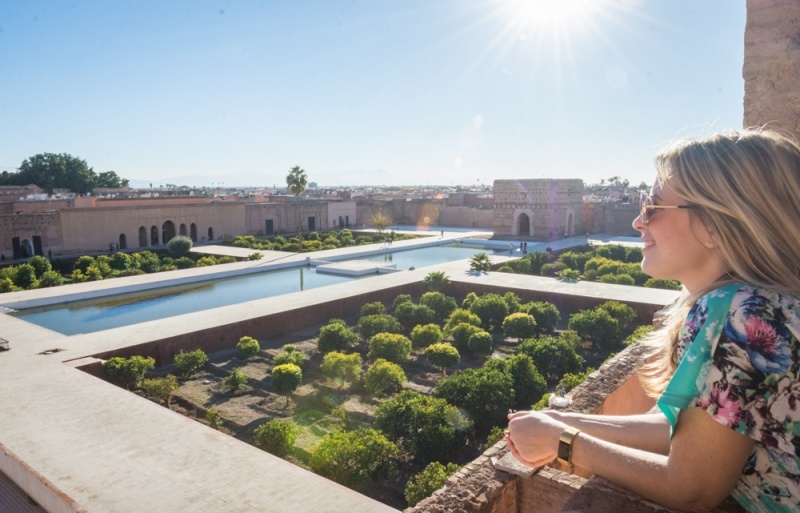 Morocco offers a 3-month tourist visa on arrival for citizens of many countries including the US, Canada, members of the EU, Australia and New Zealand. If you plan to stay longer you will need to apply for an extension visa with the Moroccan government. Be sure that your passport is valid for at least 6 months from the time you enter Morocco. Learn a few phrases in Arabic to get around! “Al Salam Alaikum” (pronouned sall-em wall-a-come) is a nice way to say “hello”. “Shukran” (pronounced shoo kran) is “thank you”. “Ma’-Elsalama” (pronounced ma sell lem-a) is “goodbye”. If you would prefer to speak in French, “Bonjour” is “hello”, “Merci” is “thank you” and “S’il Vous Plaît” is “please”. Download an offline map via Google Maps. It is surprisingly accurate and considering that there are very few street signs (or any signs for that matter), it will keep you from having to ask for help (read more about this scam below). 93% of the population of Morocco is considered to be religious with Islam being not only the primary religion but also the established state religion in the country. And the vast majority of those are Sunni Muslim. As with most conservative countries, women are expected to cover their knees and shoulders when venturing out of the house. Remember, you’re not here to change the culture, you’re here to experience a new one. In general, non-Muslims aren’t allowed to enter mosques around Morocco. Marvel at their beautiful architecture from the outside but don’t attempt to go inside (unless you are Muslim). Friday is the Muslim prayer day so don’t be surprised if some restaurants and shops are closed. The crime rate in Morocco is fairly low. Petty crime like pickpocketing is common in tourist areas and on beaches so be sure to keep an eye on your belongings. Women traveling alone will likely get some unwanted attention from aggressive men. Be aware of common scams. Because Marrakech is made up of hundreds of narrow alleyways and very few street signs, finding your way around can be challenging. You’ll likely encounter quite a few (male) strangers offering to “help”. They’ll want to show you the way and then point and say “it’s just right there around the corner” and ask for a tip. Unfortunately, they’ve just gotten you more lost than you were to begin with. You’ll also get quite a few people telling you “nothing is down there” or “you don’t want to go that way” or “that site is closed today”. Just follow your map and ignore them. Travelers who want to keep in touch with their friends and family back home needn’t worry, WiFi is available in pretty much every hotel, restaurant, and coffee shop in the city. But as with every public WiFi connection, you can’t always guarantee the security of your data. To ensure your online safety, be sure to download a VPN before departing, just in case. ExpressVPN provides VPN apps that allow you to access content from your home and ensures that your browsing experience is not affected by censorship. As with anywhere in the world, most people generally mind their own business. So if someone is going out of their way to be helpful when you’re not asking for it, they probably have ulterior motives. And lastly, be sure that you receive the correct change when you pay for anything in cash. The best time to visit Morocco will depend on the areas of the country that you plan on visiting. If you are keen to visit the Sahara Desert, you’ll find the summer months of June to August to be sweltering. But the coastal town of Essaouira will be incredibly pleasant during those months. The winter months of November to February experience mild temperatures although if you plan to visit the Atlas mountains (and the blue city of Chefchaouen) they can be exceptionally cold during that time. You’ll find the most pleasant temperatures throughout the varying regions in the spring (mid-March to May) and in the Fall (September to October). If your Morocco itinerary includes visiting Marrakech in the summer months you’ll likely be uncomfortably hot when venturing outside so plan accordingly. TIP: If your trip to Marrakech falls during the holy month of Ramadan, you’ll find a very different atmosphere. During that month, which takes place in the ninth month of the Islamic calendar, Muslims must fast from dawn until dusk. Because they are only allowed to work 6 hours/day most businesses operate on a reduced schedule. Visitors will find Marrakech to be a fairly inexpensive city to visit. Plan on spending in the neighborhood of 600-1000 Dhs/night for a riad in Marrakech and around 100 Dhs/person on average for meals. You’ll be pleasantly surprised by how inexpensive leather goods in the souks are after a little friendly haggling. And entrance fees for the main tourist sites are unbelievably cheap! As mentioned earlier, women are expected to cover their knees and shoulders but Morocco can be both incredibly hot and incredibly cold. Long, comfortable pants, button-down shirts, long dresses, a warm sweater, and a scarf to cover your head if you ever feel out-of-place are recommended. You’ll be walking a lot and the streets can be dirt or cobblestone or anything in-between. Opt for comfortable, close-toed flats over flip flops. The international Marrakech airport is Menara Airport (RAK). Many cities around the world have frequent flights into and out of Marrakech. Ryanair and Vueling offer low-cost flights from many European cities. When you initially arrive in Marrakech, the easiest way to get from the airport to your riad is to arrange a shuttle ahead of time. Because of the narrow alleyways, most cars can’t drop you off in front of your riad so you’ll have some walking (and navigating) to do. And with those annoying scammers on the prowl, it can be an incredibly frustrating experience. If you arrange with your riad in advance, they’ll have someone meet you at the drop-off point to carry your bag and walk you directly to the front door. You’ll find taxis everywhere in the city but especially congregated at the entrance to tourist sites. Most prefer not to use the meter so be sure to negotiate the price up front. Check with your riad manager on what a fair taxi fare is to various sites around town. Rather than staying in a hotel while visiting Morocco, many tourists opt instead for a more traditional experience. 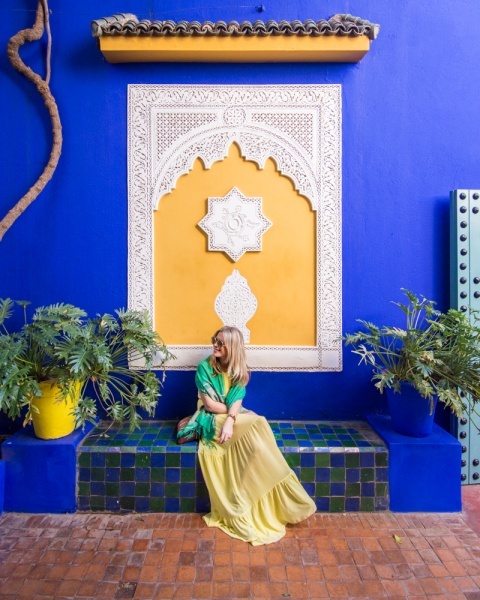 A riad is a traditional Moroccan house that has an interior courtyard. Many of the riads in Marrakech are brightly colored and filled with lush plants. The sun shines in from the open roof above the courtyard to bathe the riad in the afternoon light. Many riads also offer rooftop lounge areas where you can relax on comfortable cushions while enjoying views of the entire city. Riad ChiChi is a quaint, charming riad centrally located in the heart of Marrakech. It is a simple and classic riad, with white washed walls and splashes of vibrant blue throughout. Intricate Moroccan lamps hang from the ceilings of the spacious, modern rooms. Start your day with a delicious breakfast in the brightly lit courtyard where you’ll enjoy views of the lattice framed doors and the lovely dipping pool. The pool is also the perfect place to rest your weary feet at the end of the day. The views of the city from the rooftop of the riad during sunset are truly spectacular! If being in the center of the bustling medina is not your cup of tea, the Riad Ariha is farther north in a less touristy part of town. Similar in style to the ChiChi, this riad has a beautiful central courtyard with lush greenery growing up the walls and windows covered in intricately patterned shutters. You can’t go wrong with either option! TIP: Keep small change on you to tip the kitchen staff, the housekeepers, and any other helpful hotel staff members. Tajine – a variety of meats and vegetables are slow cooked inside of a clay pot with a conical lid. 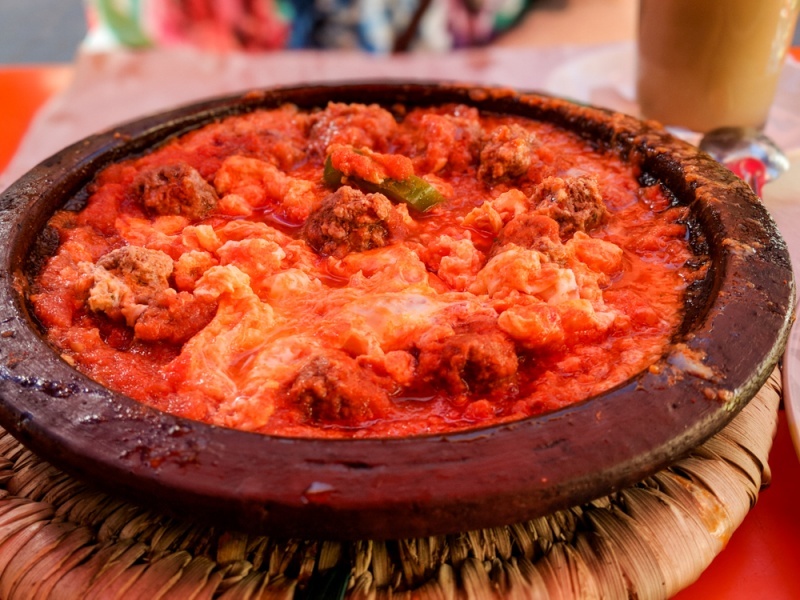 Beef, lamb, chicken, and meatball tajines are incredibly common and can be found at almost any restaurant serving Moroccan food. Couscous – consisting of very small steamed balls of crushed durum wheat semolina (resembling rice), usually served with stew spooned on top and some type of meat with vegetables. 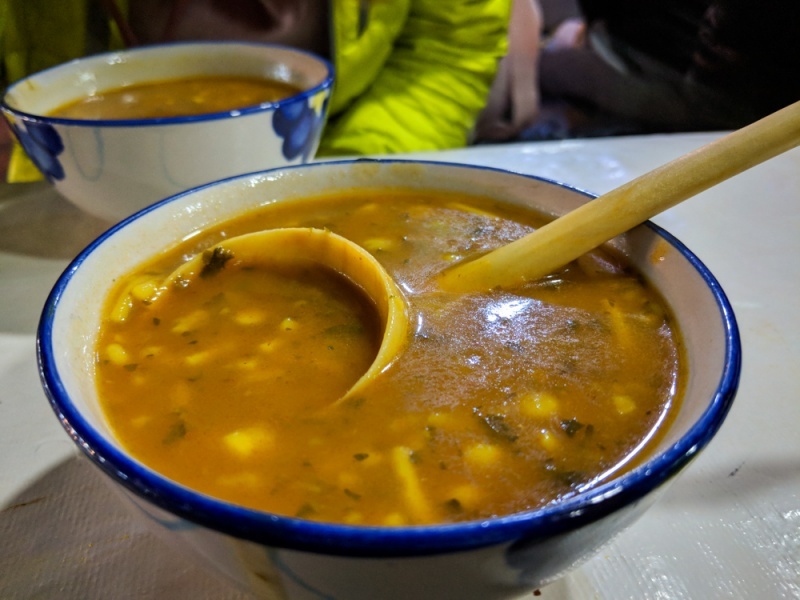 Moroccan Soup – a thick, creamy soup made of chickpeas. It is served in most restaurants and by many street vendors all over the old city. Msemen – flattened square-shaped dough is kneaded together with a mixture of peppers, onion, and tomato and then grilled, rolled, and eaten on the go! You can find a few street food msemen vendors around the Medina. Mint Tea – this sugary sweet tea is full of fresh mint leaves and expert pourers can hit a small glass from a foot or more above! We actually have an entire post on our favorite Moroccan foods! The food stalls in Jemaa el-Fnaa – for fresh, fast, and cheap food in the middle of the bustling square! Beware that the touts trying to get you to sit at their stall are incredibly aggressive and can be very rude. Bazaar Cafe – for stunning city views on their rooftop terrace and a delectable lamb tajine! You can also get alcoholic beverages here (which you can’t find at many restaurants in the old city). Atay Cafe – for a casual atmosphere and a fresh and delicious avocado tomato salad. The pastilla made of cinnamon, almond, and chicken is a must-try as well! Restaurant Dar Zellij – if you’re looking for high quality food in a more upscale atmosphere, this is a must-visit spot right near the Riad Ariha. Hôtel Restaurant Café de France – the TripAdvisor reviews are harsh but we thoroughly enjoyed our mint tea and lemon chicken tajine while watching the sun set over Jemaa el-Fnaa! During my first trip to Morocco in 2016 I had such a difficult time finding any restaurants that served wine that I finally gave up and paid my riad manager to buy me a bottle at the grocery store. It seemed during this trip that more restaurants were beginning to cater to foreigners and we encountered several offering (pricey) beer, wine, and cocktails. 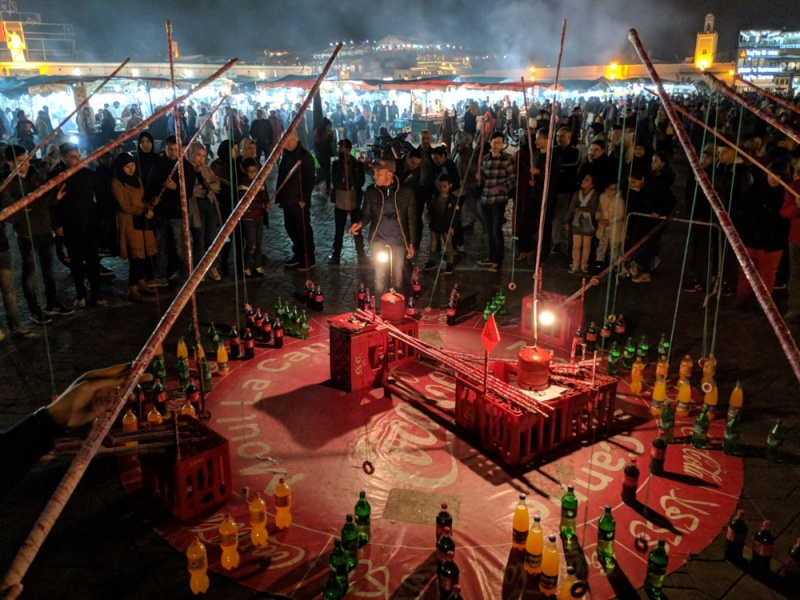 But being a predominately Muslim country, you’re unlikely to see many Moroccans imbibing in public and intoxication is most definitely frowned upon. While Moroccans generally don’t follow these guidelines, as with most other countries a more generous tip is expected from foreigners. These are just guidelines, of course, and you should tip more if you had amazing service and less if you didn’t. 10% at restaurants (be sure that a service charge hasn’t already been added to your bill). Many taxis in Marrakech prefer not to give foreigners rides on the meter. Check before you accept a ride and negotiate a fair price. In that case, no need to tip. If you receive a ride on the meter, just round up (if the ride costs 8 Dhs, round up to 10). 10-20 Dhs for someone who has carried your bag for a reasonable distance on their back or in a cart or on a mule. 10-20 Dhs per day for the housekeeping staff at your riad. 30-50 Dhs per day for a riad manager depending on how much you rely on them for booking tours and transportation. 100 – 300 Dhs for a guide on a half day or full day tour. Despite Morocco being an incredibly photogenic country, some Moroccans prefer not to be photographed. This may be due to religious reasons that are referred to as aniconism in Islam or it may simply be due to the massive tourism boom that has occurred recently. Aniconism is a proscription against the creation of images of sentient beings (humans and animals). This is why so much Islamic art is dominated by geometric patterns, calligraphy, and occasionally foliage patterns rather than of figures. Regardless of any religous beliefs, it is always polite to ask anyone before taking their photograph. Or, if you can’t speak the language, indicate your request with non-verbal queues. Don’t be surprised if you are turned down or asked for a tip. In fact, even if you are not attempting to take a photograph of a local but they are in the vicinity of your lens, you may find that they attempt to block their face or even get offended or angry. I had a man who assumed I was taking a photo of a women (I wasn’t) and angrily ask to see the picture that I took. What to see in Marrakech: Don’t Miss These Top Sites! Le Jardin Secret – in the middle of the hectic, winding alleyways of the medina, Le Jardin Secret is the perfect place to relax your feet and unwind. 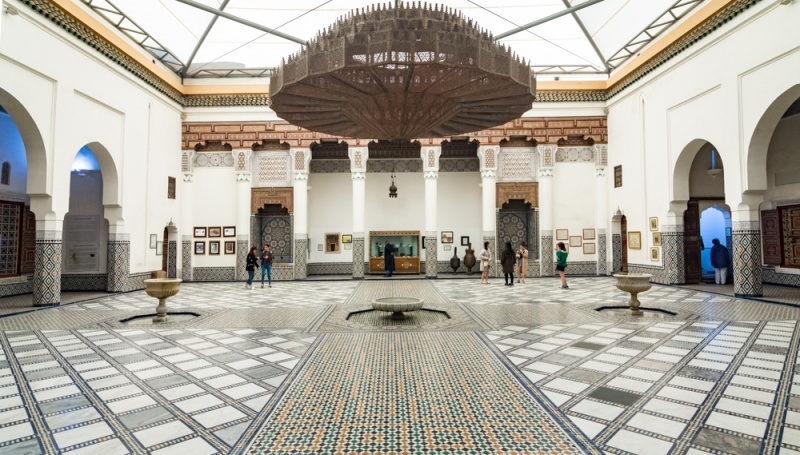 It is one of the largest and oldest riads in the medina and took 3 years to restore the grounds to what you see today. Wander around the gardens and enjoy a coffee with a view from the terrace. Jardin Majorelle – this beautiful art deco house and stunning surrounding garden was owned by the French orientalist painter, Jacques Majorelle in the early 1900s and was purchased by the designer, Yves Saint Laurent in 1980. You can visit several museums or simply wander around the courtyard, admiring the strange cacti, the splashes of the signature bright blue painted throughout, and the coy fish swimming in the reflection pools. Go early in the morning or after 16:00 to avoid the crowds. Entrance fee: 70 Dhs for the garden, 30 Dhs for the Berber Museum, 100 Dhs for the Yves Saint Laurent Museum, or 180 Dhs for a combined ticket to see all three. Hours: open every day from October 1st until April 30th from 8:00 – 18:00 with the last admission at 17:30. 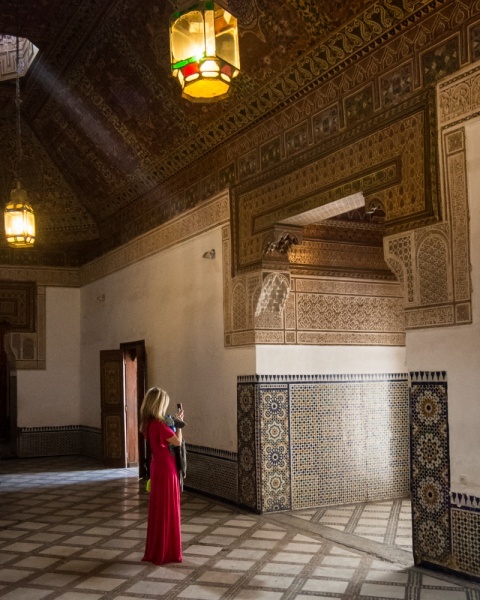 Bahia Palace – this massive and ornate palace from the nineteenth century is absolutely a must-see in Marrakech! The name Bahia means “brilliance” and with lush gardens, large courtyards, and ornate architecture, it more than lives up to its name! 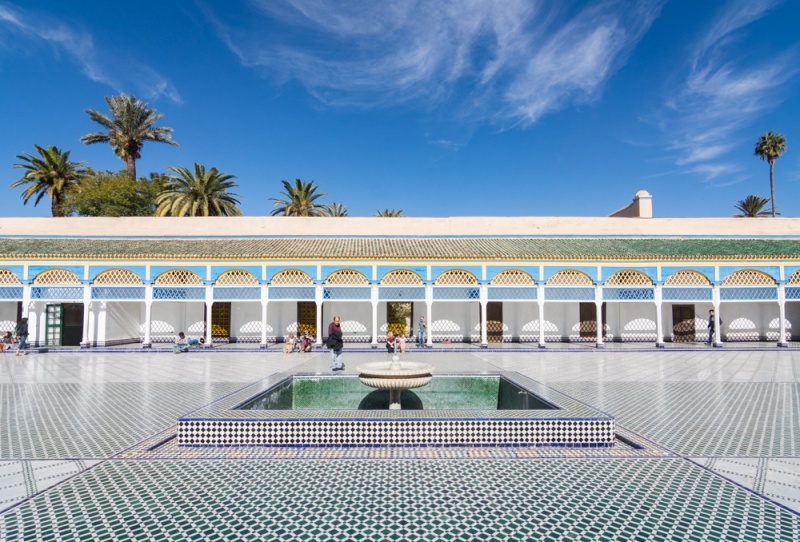 It was considered to be the largest and most luxurious palace in all of Morocco in its heyday. El Badi Palace – built throughout the reign of the Saadian sultan, Ahmed El Mansour from 1578 – 1603, this was a lavish palace at it’s prime. Unfortunately it has fallen in ruin but is constantly being renovated. A courtyard with sunken vegetation and several pools sit inside of the thick walls where large storks now nest. There are several small museums as well as a terrace overlooking the courtyard. 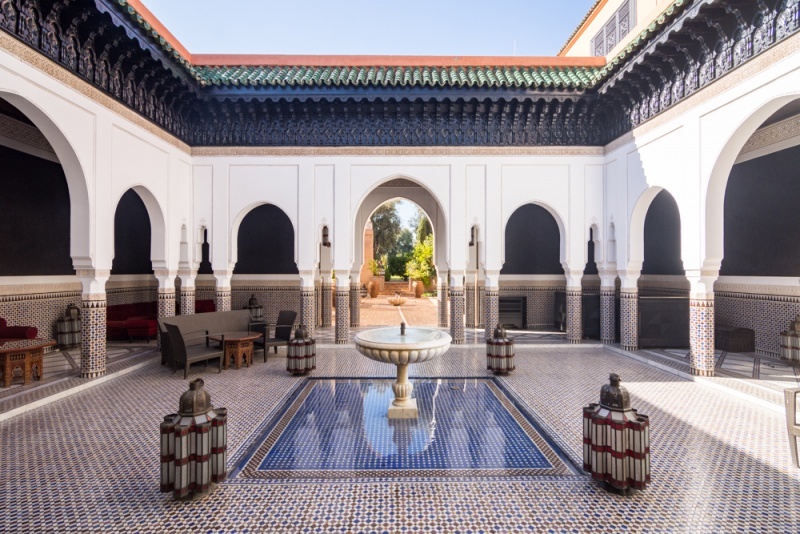 La Mamounia Palace Hotel – this strikingly beautiful property was formally a palace and has been transformed into arguably the most luxurious hotel in all of Marrakech. Even if you are not staying at the hotel, it’s worth a visit to wander around the lobby area or enjoy an overpriced coffee in the lush gardens out back. Marrakech Museum – the actual artwork in this museum is not nearly as impressive as the building that they are housed in. The large, covered courtyard is one of the most picturesque places in the city! House of Photography in Marrakech – showcasing beautiful photographs in and around Marrakech as well as many portraits of Moroccan people taken in the 1930s and 1940s. The artwork is contained in a riad that is beautiful as well. Have a coffee on the roof and enjoy views of the city below! Jemaa el-Fnaa – the central square in the heart of Marrakech is buzzing with activity at all hours of every day. During the day you can get fresh pressed juice or dried figs at one of the many street vendors and wander around watching people try their luck at street games. Don’t be surprised if someone tries to put a monkey on your shoulder for a fee. If you stop to look at any of the entertainers you’ll be expected to give a small tip (10 Dhs should suffice). At night the square is packed with people eating at the food stalls, watching the male belly dancers, or sitting on stools listening to the many musicians jamming out. The food stall touts are aggressive and cruel when you tell them no, beware. 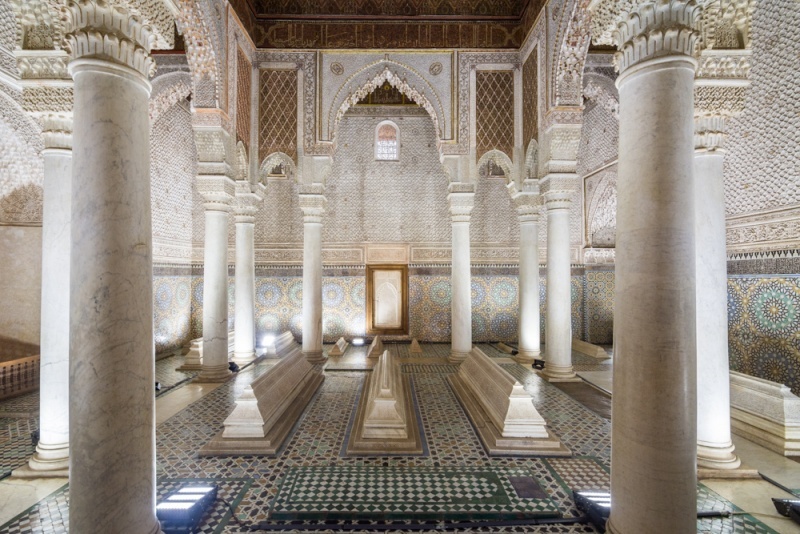 Saadian Tombs – the intricate architecture that houses the Saadian tombs is well worth the inexpensive entrance fee. The area of the tombs is small and easy to tackle in around 30 minutes. Bab Agnaou – this entrance into the red walls of the old city is quite detailed and ornate. It is situated on a busy street so taking photographs can be difficult but it’s worth passing through to see it for yourself. Koutoubia Mosque and Minaret – while non-Muslims are forbidden from entering the mosques in Marrakech, you can still enjoy views of the beautiful structure from the outside. Ben Youssef Medersa (Madrasa) – sadly this historic site and former Islamic college was under construction during our visit and will not be finished until October of 2020. 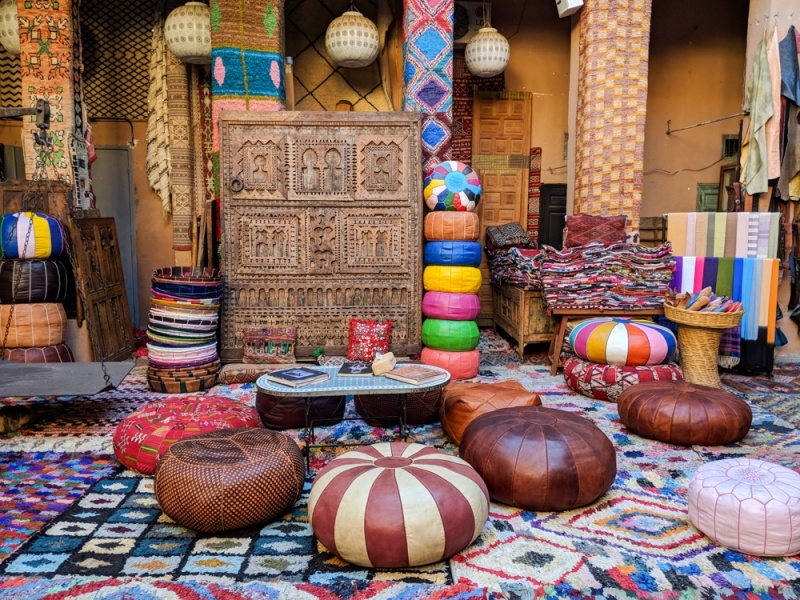 Ensemble Artisanal – if being hassled and getting involved in aggressive price negotiations isn’t your cup tea, you’ll find this small shopping area to be more relaxing (but with higher prices that the souk). The building housing the shops is worth wandering through even if you don’t buy anything! Souk Semmarine – this souk starts at the Jemaa el-Fnaa and runs north in the maze of alleyways crisscrossing throughout the medina. It is sheer madness but you’ll find a wide selection of rugs, blankets, leather goods, pottery, and lamps at reasonable prices (if you negotiate hard enough). But get ready to get hassled! Watch the sunset over the main square – there are dozens of restaurants surrounding the Jemaa el-Fnaa offering terraces with stunning views of the madness below. Grab a front table at least an hour before sunset to enjoy the views while sipping mint tea. We enjoyed the view and the lemon chicken tajine at the Hôtel Restaurant Café de France. Visit a hammam – honestly, I found this to be an incredibly awkward experience. But it made for a great story so in the end, it was worth it being naked with a few strangers. You’ll undress down to your underwear, then get dosed with water and scrubbed down, then sit silently in a sauna for 15 minutes, and finally get one last rinse. Don’t expect a relaxing experience unless you opt for an expensive, touristy, and not-so-authentic hammam. Take a day trip into the desert – you’ll find no shortage of tour agencies around town offering daily desert excursions and camel rides. They’ll take you just a few hours outside of Marrakech so if you’re short on time it’s an easy way to fulfill your Moroccan Sahara dream. Or better yet, drive yourself! Love that Marrakech can mean ” pass by quickly”. It always reminded me of a Star Wars set with men in Jedi robes, now I shall think of it as Mos Eisley. Loved our time there long long ago. Marrakech has been on our list for some time now. We keep thinking we will get over there on one of our trips to Ethiopia or Dubai but we just haven’t been able to make it work yet. That said, this post was so informational, one of the best I have come across. I do have a question. Would you recommend taking children or do you think it is best to travel here with teens/ adults? I saw some of these pics in Insta and found them so beautiful. Getting to read your informative post now. The tile work in the places and mosque are so stunning, they sure knew how to use patterns. Love those little seating cushions. Are they easy to bring back home? Your hotel room looked so charming! I think your advice about photography is spot on- you don’t want to upset people and, combined with religious believes, it could be very easy to accidentally upset people. I wonder if there’s a photography tour in the area – it would be great to combine a guide and some great photo opps. Wonderful and comprehensive. I’d love to put your suggestions to work. Will definitely keep my eyes on my map and not encourage the ‘helpful’ touts. It’s no fun visiting a place and feeling like a mark! Marrakech is in my dreams. Thanks for sharing this comprehensive guide to Marrakech. It seems that I heard a lot about this destination in 2017 so not surprised to hear that tourism is so high. This has never been on my list to visit but it seems that food, accommodations and things to do have enough variety for everyone. I am always conscious of the scammers but if they leave when you say “no”, then I can deal with it. I have pinned this for future reference if Marrakech gets on our travel plans! Oh your pictures are so beautiful. I am loving everything in Marrakech, Morocco. It looks like a dream destination and would love to visit this place before it becomes too touristy. Your this guide, picking tips and general tips are going to be super helpful while touring around the place. I will surely download the map and keep distance from the touts. Wonderful post and pictures. This is a great and super thorough guide to Marrakech. I really appreciate the tipping portion of this guide. That’s always so difficult. We’re heading to Marrakech in March and I just cannot wait. Pinned your guide for further use! 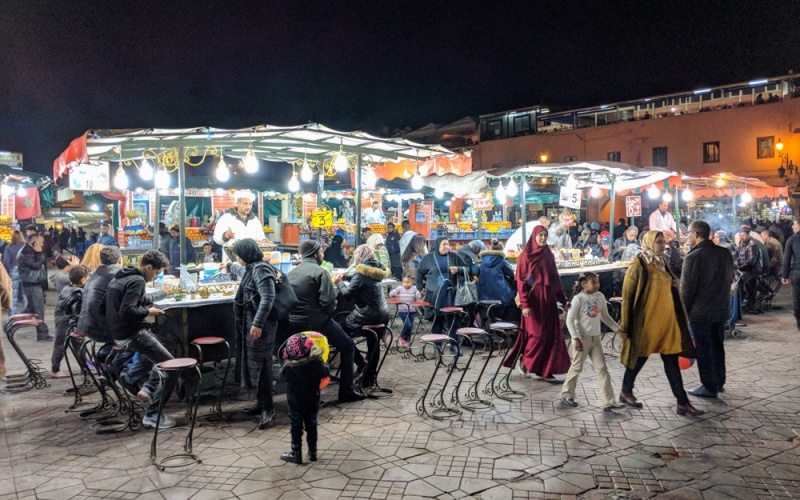 I don’t think I’ve read a more detailed post about Marrakech than this one – you’ve covered everything that one might want to know before travelling to a city. 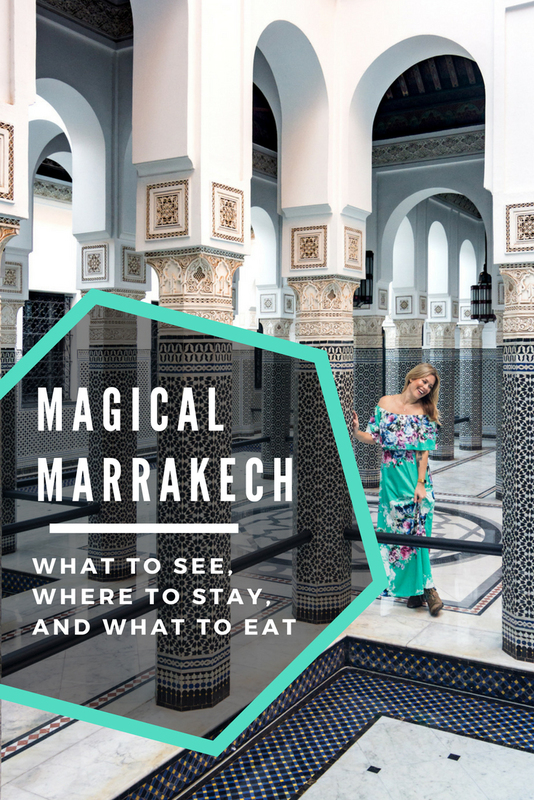 From best time to travel, to where to stay and where (and what) to eat, I do not need to look elsewhere when I do my research on travelling to Marrakech. I also love your photos and your dresses are amazing! Its a very important thing to talk about – safety aspect and I am glad you’ve covered that too. I love Moroccan food by the way 🙂 I’m so looking forward to get to Morocco, I will bookmark your post for future reference! Thank you so much for this post, it’s so detailed. Can you recommend any hammams? As a Brit, being naked aroudn strangers is not something I’ve ever encountered and I’m not super excited about it, but I want to experience local culture.